Yes Waste can collect broken or disused printers and photocopiers from companies and small businesses in Yorkshire. We collect all kinds of IT and electrical waste for disposal and recycling. Does your printer still work? If your printer still works, you could consider selling it on, or donating it to a charity. Not all charities will take electrical items, as they could be hazardous. Other charities may require you to bring the printer into them, which can be a challenge for larger photocopiers. Martin House in Wetherby is one organisation which accepts electrical goods. What happens when you recycle your printer? Like a number of items, parts of printers can be recycled and some not. Printers themselves are not considered hazardous. Your items will be dismantled at a basic level so that parts which are metal, glass and plastic are separated. 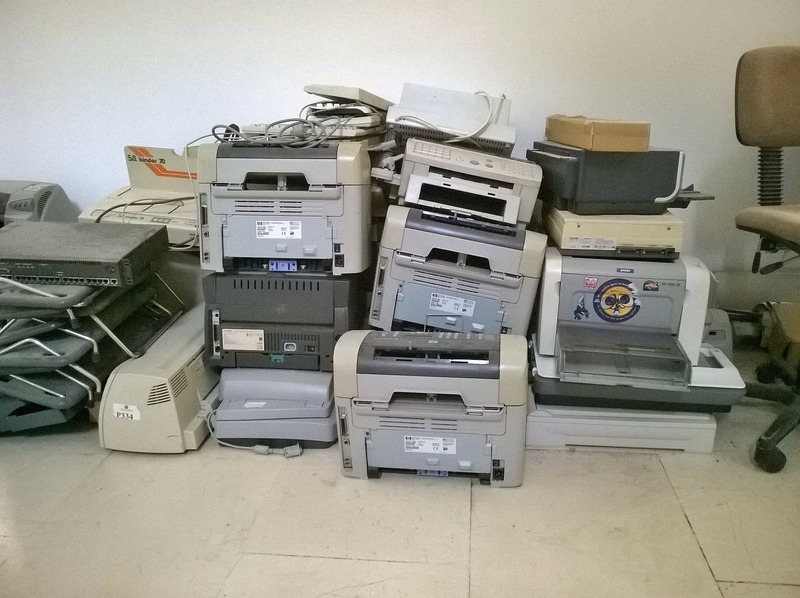 The printer or photocopier is then sent to specialist recyclers who can remove and recycle circuit boards. Finally, the machine is broken up into small parts which are separated mechanically, or melted and recycled into other parts. Toner is considered hazardous waste, and you should be aware that this means disposing of it properly. We remove any toner from any printing devices and send it to specialists in order to protect the environment. If you use a lot of toner, you may find many toner cartridge manufacturers will take back old cartridges. This will either be at your cost or theirs. This is the HP Recycling Page. How to arrange Yes Waste to collect your broken printer. Yes Waste can collect broken printers and photocopiers from offices across Yorkshire at a competitive price. We also collect all kinds of rubbish in cities including Leeds, Huddersfield and Wakefield. Get in touch by calling 0800 058 2522, emailing info@yeswaste.com or send a message using the chat function at the bottom of the page.